In mammals, most physiological and behavioral events are subjected to well-controlled daily oscillation, and these rhythms are controlled by the hypothalamic suprachiasmatic nucleus (SCN) in the brain. Recent studies revealed that the SCN is a hierarchical and multi-oscillator system in which the neuronal network plays a critical role in expressing robust and coherent rhythms in physiology and behavior. To understand the mechanisms of the circadian clock at network level, one needs to visualize the SCN network at high resolution spatially and temporally. We developed a time-lapse fluorescence imaging system composed of a Nipkow-spinning disk confocal microscope and high sensitive CCD camera. Using various genetically encoded sensors, we are trying to visualize the spatial and temporal patterns of circadian rhythms in intracellular calcium, clock gene product, and membrane potential in a large population of neurons in the SCN. Fig.1. (top) Drawing of a mouse brain. SCN is located in the hypothalamus which receives photic input from the retina. (bottom) SCN sends major output signals to the PVN. Fig.2. (top) Expression pattern of calcium-sensitive probe, GCaMP6s, in the SCN and PVN. 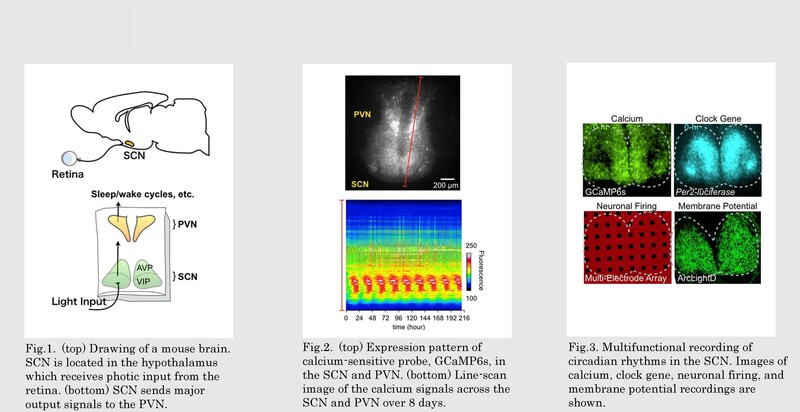 (bottom) Line-scan image of the calcium signals across the SCN and PVN over 8 days. Fig.3. Multifunctional recording of circadian rhythms in the SCN. Images of calcium, clock gene, neuronal firing, and membrane potential recordings are shown. Ono et al., PNAS, 201613374, 2017. 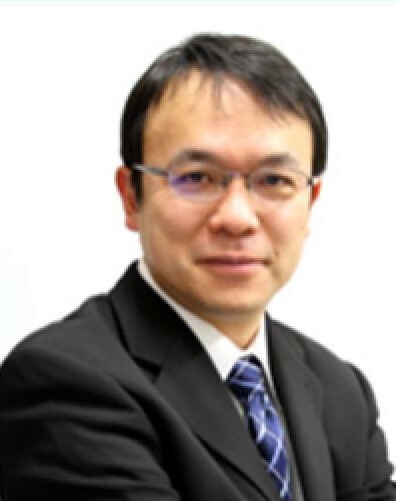 Enoki et al., PNAS, 2017. Enoki et al, Scientific Reports, 7:41733. 2017. Enoki et al., PNAS, 109(52):21498-503. 2012. Enoki et al., Neuron, 62.242-253, 2008.